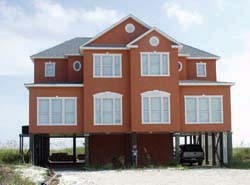 Duplexes are types of multi-family house plans that have two separate units that share a common wall. Similar to townhouses, they are usually constructed in groups of three or more and often mimic the style of a single-family dwelling. Duplex home designs can be several floors or just one and can have multiple front entrances for each unit, or one single entrance that has a hall leading to the individual living areas. They can be an excellent choice if you're looking for a home with an in-law suite or guest house. The has 6 bedrooms, 2 full baths and 2 half baths. 3112 Sq. Ft., Width 48'-0", Depth 36'-0"
2760 Sq. Ft., Width 42'-0", Depth 34'-0"
2734 Sq. Ft., Width 60'-0", Depth 79'-0"
The has 6 bedrooms, 4 full baths and 2 half baths. 3170 Sq. Ft., Width 44'-0", Depth 65'-0"
Browse our duplex home plans featuring two separate dwellings, perfect for investment purposes, or keeping an inlaw or adult child nearby. With a diverse variety of duplex designs, we are sure you'll find the perfect floor plan that is attractive and functional for your lifestyle.